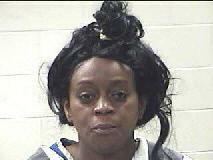 Annika Santelle Rhone, 40, of Houston, was driving with over 50 lbs. of marijuana in her trunk. Local State Trooper Makes Large Drug Bust in a Routine Traffic Stop, SEVEN OAKS, May 7, 2014 - At approximately 10:30 am on May 7, 2014, Trooper Chad Seamans with the Texas Highway Patrol was on patrol on US-59 in Seven Oaks when he spotted a north-bound 2014 Toyota Camry. Trooper Seamans initiated a traffic stop when he observed one of the passengers not wearing a seatbelt. When Seamans spoke to the driver and two passengers, they gave conflicting stories about where they were going and what they were doing. Seamans asked the driver, Annika Rhone, 40, of Houston, for consent to search her vehicle. Rhone gave consent for Seamans to search her vehicle. When Seamans opened the trunk of her car, he uncovered two large boxes that were under laundry. When Seamans opened the boxes, he noted that they were filled with saran wrapped bundles of marijuana. Seamans placed Annika Rhone under arrest and charged her with felony possession of marijuana. Rhone was driven to Polk County Jail and booked in. Her vehicle was driven from the scene by one of her passengers. Rhone had 52.2 lbs. of marijuana in the trunk of her car.